Unlike the months before this Friday Favorites isn't themed. However, all these posts are lifestyle related and inspirational. I love each of their perspectives on the topic they're discussing so I thought I'd share them with you all. Just by the title I already knew I was going to love this post. Chelsea from Inspiration Indulgence talks about how hard it is to adult. Then goes on to tell us that sometimes we just need to break free and have a little fun, similar to how it was when we were children. Create a little magic each day. She's right. We should break out in dance or song when you hear something you like. Go swinging. Order a happy meal. We all get those days where just like "I'm not adulting today" some of us can't really do that because obviously there's things we need to get done. However, when you're finished with what you need to do or if what you're doing isn't urgent. May from May Living shares some great ideas on what you could be doing instead like pamper yourself & having some breakfast in bed. Some of just hate Monday's. It's the ending of the weekend and sometimes you really don't want to adult. Lindsey from Ce'st La Vie She Said gives 5 reasons why you should be more motivated on Monday. Since I started exercising I've grown to love Mondays. It's not as bad you think especially if you do the things she tells you in her blog post. This happens to be one of my goals for the May Aspirations Link-up. Accepting compliments aren't really my strong suit and people who know me personally can attest to that. Lindsay from Its Simply Lindsay shares why it's important to start being able to accept and give compliments. Whether or not you're able to accept compliments also reveals something about what you think of yourself. Everyone here is beautiful and awesome so we should all be able to accept compliments since they're true. Woohoo! That wraps up my Friday Favorites. 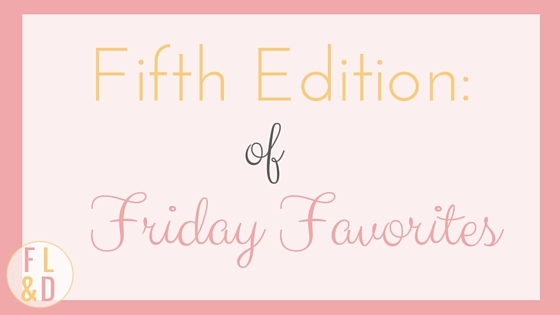 Any favorite reads of the week comment below so I can check them out? I hope you all have a lovely weekend. Sunday is the Aspirations Link-up so I'll be setting some goals for May and letting you know how I did on my goals for April. You should definitely make some aspirations and link-up with Angela from The Clutter Box Blog and I. The link-up will be open for two weeks so you have plenty time to share your goals. We'd love to have you.